Mamarazzi got this from BookXcess during their 3rd Anniversary Promotion. If not mistaken there was an additional 20% on top of the price state. It was an impulse buy and she had no regret in getting this book. What attracted Mamarazzi to this books was the author's name. She is crazy about Asian writers. Have you heard of "Slumdog Millionaire"?It's written by this author. The story starts with the murder of the notorious, Vicky Rai, the son of a corrupted politician and gangster, Jagannath Rai. Vicky Rai was shot at a party in his home. The party was to celebrate his acquittal of a murder case. Six people were found with guns in their possession when the police seal-off the murder scene. 1)Mohan Kumar, the Bureaucrat. He is as corrupted as can be. One day he went for a seance and the spirit of Mahatma Gandhi seems to have possessed him. Since then he was like Dr Jekyll and Mr Hyde. Scaring the people around him with his multiple personality. 2)Shabnam Saxena, The Actress. She is very successful and is the subject of envy for many people. Despite the stardom, she hungers for her family love. She trusted people and was bitterly betrayed. 3) Eketi, the tribal who travel from his native Andaman Island to India to retrieve a sacred object that was stolen from his people. At first he thought India is a good place to stay on but later found out that it is a very harsh place. People were very cruel, unlike those in his Island. He dreamt of going back to his beloved Island once he retrieved the stolen object and also bring his new found love back with him. 4) Munna Mobile, the Thief. His speciality is to steal handphones. He met a rich girl. At first he was just fooling around looking for a quick lay but then he fell in love. It's a forbidden love as they are of different caste. 5) Jagannath Rai, the Politician. He is a very corrupted and an ambitious politician who happens to be the father of Vicky Rai. He is like a gangster. Did many crimes and yet he always got away with it because people are too scared to go against him. Those who are brave enough were "eliminated". He wanted to be the next Chief Minister and Vicky Rai stood in his way. 6) Larry Page, the American who works as a forklift operator and have the same name as the Google's founding CEO. He is like "Mr. Bean". Always get in to trouble but some how he is always lucky enough scrape thru it. He came to India to marry his "Mail Ordered Bride". The above mentioned people have motive to murder Vicky Rai. The characters in this book are well developed and very lively. Mamarazzi can't help laughing like a hyena at the things that Larry got himself into. Also can't help felling anxious about Shabnam's and Munna's predicament. 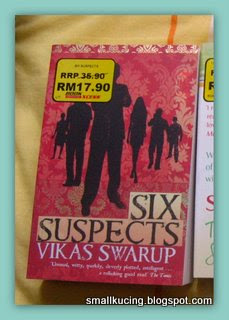 This book is a must read for all mystery fan and those who love a bit of spice in their live. 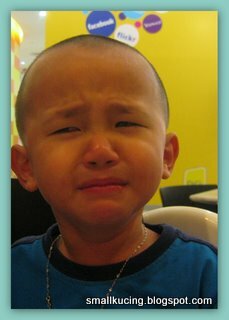 *sob*sob* am not crying because Mamarazzi cooked "Rojak Vege" for me to eat again as in when she was reading Paul Coelho book. But rather Mamarazzi said she wanna go hunting for more books written by of Vikas Swarup. This means less time for me to go play in Dan Neh Noh. Aiya... come la... Auntie babysit you, we go play and eat Dan Neh Noh while your Mamarazzi go on rampage. Wan bo? Auntie teman you. You just need to bodek Mamarazzi make leong sui for Auntie, can liao... LOL! Come...come...I send my lawyer friend over to see you and you can sue your mama for child neglect. Then I can adopt you...and feed you till you are pui-pui sui-sui like me and your papa... Hehehehehehe!!!! hmmm I love this defitely a must read! I want Dan Neh Noh punya can or not? sounds like a very interesting book.. haven't gotten around to watching slumdog millionaire yet.. can you believe it?? (but I read somewhere that in this case the movie was actually better than the book) ..
am also trying to diversify my choice in authors :) u're a great source of info for that ..
Mamarazzi caught part of the movie only. I was good. hehe.. not a book fest, it's a bookstore called The Big BookShop at The Mall (near PWTC).. actually it has quite alot of books (but nowehere near as many as big bookstores).. the prices are ok.. many below RM20, almost all below RM30 ..but really have to search for the gems..
Am starting with Destinations first (coz dont think will get much reading done this week)..